Sharny (about six) with her Mother Peg. Sharny performing at The Basement, Sydney in 1982. 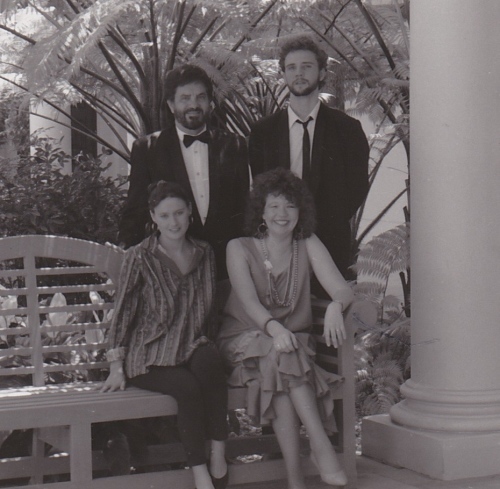 Latin Mischief band (with Barry Sutton – percussion, Ken Edie – drums, and Helen Russell – bass), 1993. 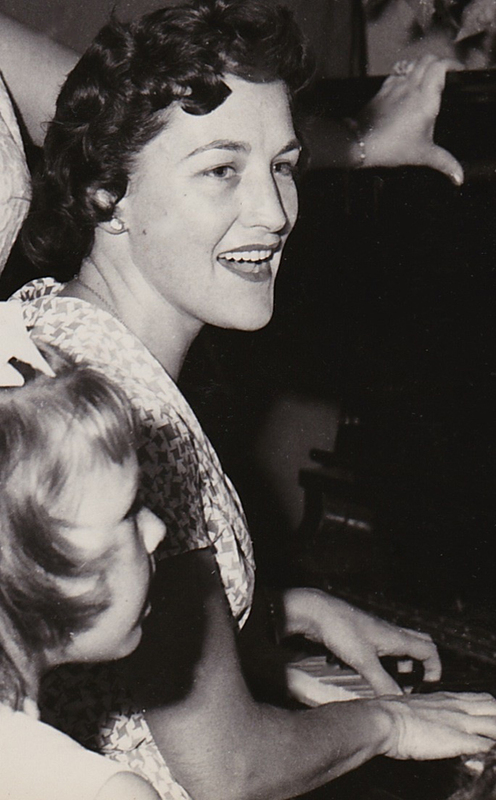 Sharny’s mother, Peg Russell, was a musician who had a “ridiculously keen ear” according to other musicians who knew her. She could hear anything. Don Burrows thought she played like Bill Evans, whom she had never heard of! She brought up her children to hear music in the same way. Younger siblings Steve Russell (pianist, musical director, bassist) and Helen Russell (bassist, musical director, vocal arranger) along with Sharny, also have this ear. When her parents worked out that it wasn’t the fridge making a high-pitched sound, but nine month old Sharny sitting on the floor whistling a note, they knew they had another muso on their hands. Her dad, Noel, was a journalist who played sax and clarinet, and joined his wife on gigs on the weekends, playing for country dances. Their little girl was picking out tunes she’d heard on the piano at three years of age, so the sensible thing to do was start lessons. What followed was a life of lessons, eisteddfods, church music involvement, community choirs, close part harmony singing, and family harmonizing in the car, the house – just about anywhere. 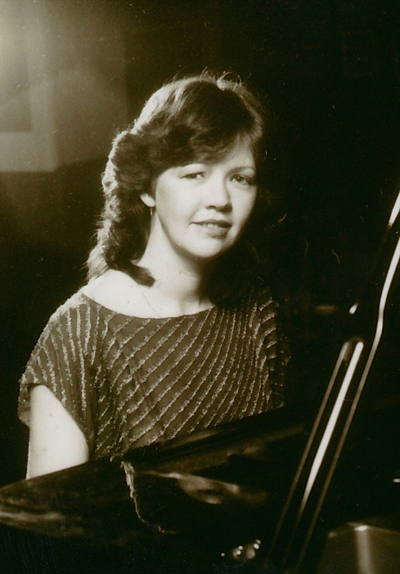 A degree in classical piano under Nancy Weir ensued. Then it started. Playing music to earn a crust . . . and she has never done anything else. Singing, playing, writing on commission, directing, recording, arranging, producing, teaching. Lucky, some would say. She ran the Yamaha Music Schools in Adelaide for six years, sang children’s songs for the ABC, and was musical director for the children’s TV program, Here’s Humphrey, for a time. All the while she was listening to the great jazz artists and syphoning their repertoire, feel, phrasing and improvisational techniques. Iconic radio jazz broadcaster, Jim McLeod, heard Sharny and said “Come, I will introduce you to Blossom Dearie – you have a lot in common.” Sharny met Blossom on more than one occasion. Sydney pianist and arranger, Julian Leigh, who loved and mentored Sharny in her time there, said she should leave Blossom’s songs alone – there was too much similarity. This was to be a life changer for Sharny. She was struggling with a debilitating chronic illness and having also battled through some other life challenges, was struggling to keep positive about her performing career. Career? There had already been so many interruptions. Right when it was blossoming, and she was involved in starting up a neat little jazz club in Adelaide, a series of events seemed to obliterate her ability to carve out any sort of performing career. A serious car accident which really should have taken her life – and supposedly her singing voice – but didn’t. A marriage affected by the head injury of her (first) husband in that same accident. And the birth of her first two children. She did manage to get to Sydney for nearly a year and play the famous venues, The Basement and The Soup Plus, on a regular basis. But as much as she wanted to stay, family issues dictated a move to her home town. A move “to the sticks”, as Julian Lee put it. But the offers of gigs kept coming and the family soon moved to Brisbane. Sharny began earning the family bread and butter, singing and playing in bars, restaurants, and the occasional spot with well-known artists. Two of those were Bob Sedergreen and Ted Vining, well-known jazz musicians and educators from Melbourne, who heard Sharny sing with a local big band at a small festival and asked her to sing with their trio. She also performed with James & John Morrison when they came to town. They all said she was “the real deal”. Another “pinch me” moment was when she had been slotted into a back-blocks spot at the well-known Bellingen Jazz Festival in 1999. She played standards and a few of her originals with a local bass player and drummer. A few days later she got a call to say she had been reviewed by Eric Myers in the National Jazz Chord magazine. He said “… Sharny takes a piano solo to which she adds, in unison, a wordless vocal. It’s an exquisite experience to hear this … done so well, with such reverence for the jazz tradition. In a world of over-rated and over-stated jazz singers, Sharny Russell is a gem. Her trio could headline any jazz festival in the country.” A review to set off any jazz career. After her conversation with Judith Durham, and a move to Byron Bay on the north coast of NSW, a new resolve arose, and in 2002 she was recording an originals album for the ABC at 301 studios (A Good Thing on Hold). Featured players were those keen-eared siblings, Steve and Helen, as well as drummer Dave Sanders, flugel horn player John Hoffmann, and alto saxophonist Dave Ades – all Sharny’s regular musical cohorts. She was never sure whether people wanted to hear her jazz originals, but it turned out they did. The Financial Review wrote: “A Good Thing on Hold is a deft set of interesting and appealing tunes… And to top it all, the relaxed, attractive and secure vocal talents of Sharny Russell. …extreme class. You know you’re in good hands.” One of the tracks on that album took the Australian Performing Rights Association (APRA) Jazz Award for the Most Performed Work in Australasia (radio play was what did it!). Being nominated alongside heavyweights, Paul Grabowsky and Allan Browne, was feather in her cap. The album remained a good seller for quite awhile, and is greatly appreciated by musicians for its originality, musical integrity and fresh compositional and arranging style. 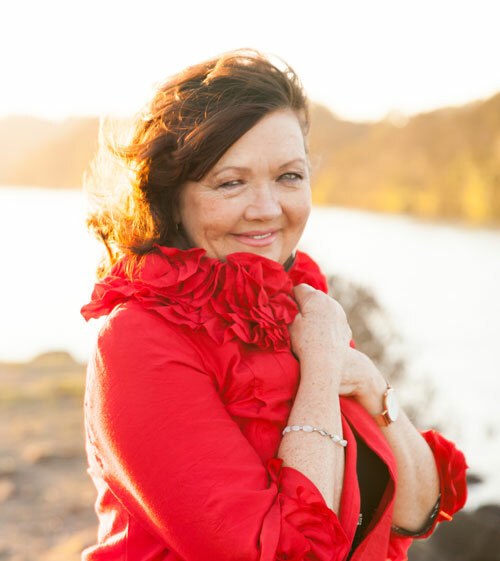 Teaching vocal jazz at Queensland Conservatorium and the Jazz Music Institute, Sharny imparts years of arranging, improvisational and compositional skill to her students. In the years to follow, apart from some major life challenges, Sharny has had some wonderful moments in jazz with some of the greatest performers in the country. She has toured with Grace Knight, supported Vince Jones, performed with George Washingmachine and Galapagos Duck, and performs and records regularly with Australian icon guitarist, George Golla. She and her siblings, who performed together regularly in Brisbane in the 80’s and 90’s, now re-unite to do Russell Family Jazz shows – and Sharny’s son, Sam, plays drums. Sharny has always been true to herself. Never a covers girl, and never an imitator. She says she hears a tune, whatever the recording, and if it appeals, she immediately begins translating it in her inner ear into her own version. You won’t hear anyone else make a song sound the same way. She has a unique, warm, sophisticated approach that has you totally surprised by the joy and intimacy of it all, and at the same time, amazed at the intricate musical intelligence at work. She’s been through the mill, but she keeps powering. Watch out for this next album – it’s going to be a hefty offering.